When I frame up a garden in my camera for a photograph I do many of the same things a designer will do when planning a garden. I look for ways to frame a composition that takes advantage of shapes and lines that will hold the composition together. A classic technique for framing a garden photograph is to look for trees. Think of the big picture, the overall view of the garden. With a camera, use the edges of the camera frame itself and fill it with only those elements that contribute to the story you want to tell. With the garden design, use the outer edges of the garden and work to fill the inside with plants and hardscape that harmonize the entire site and punctuate for accent and depth. Punctuation points allow you to juxtapose elements that will organize the frame and hold the viewer’s eye. In this first photo the simple rustic fence is a punctuation point and a way to frame the bottom of the photograph, putting it well into the foreground so we look over it and into the garden. The house at the top and the fence at the bottom thus frame the garden itself. It also helps that a good size Oak tree anchors the garden and helps keep the eye from wandering too far off the left side of this composition. When we back away from this garden we see how wonderfully the split rail fence actually frames the entire garden by simply having one section that turns at right angle at the property edge. Very often the site of the garden gives, even demands that you use certain framing tools. 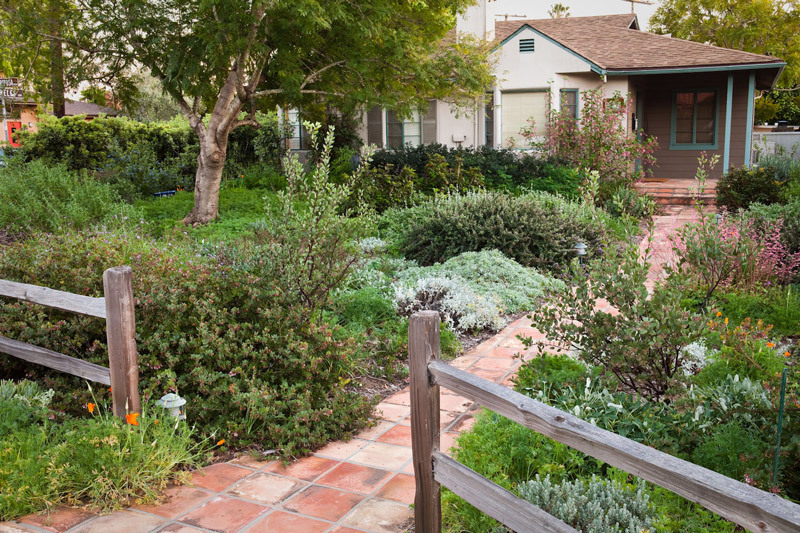 The street, a driveway, a fence, and the house itself are all opportunities to frame how the garden is laid out and then viewed. 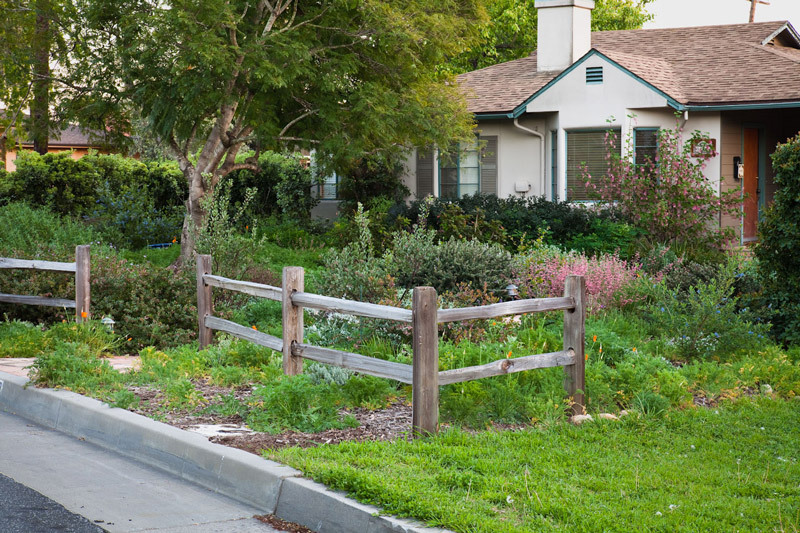 These references can then be used constructively by the designer, in this case Carol Bornstein, to figure ways to accent and punctuate the frame: a fence parallels the street, a shrub border edges the property line. And these in turn all become cues to help the photographer find ways to frame a photograph. 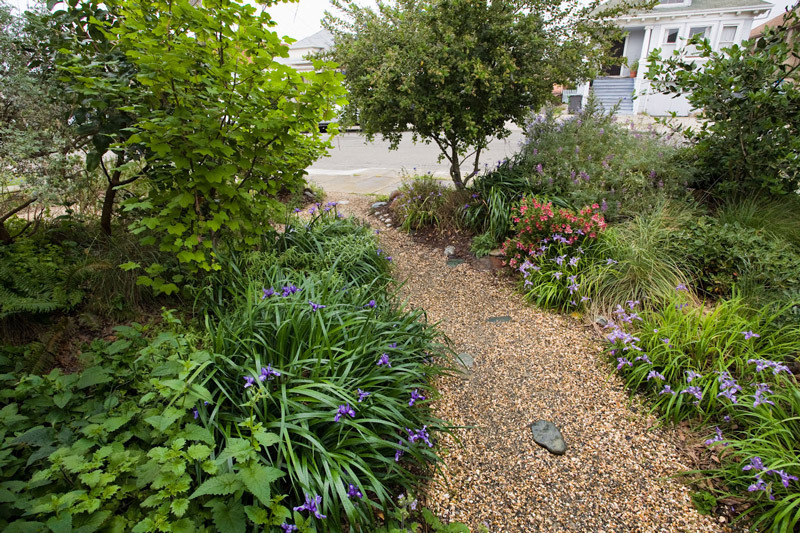 In this next garden, a tiny urban one designed by Pete Vielleux, the path leading to the back of the house is the photo subject, and it is framed by the two sides of the border. But note three shrubs, three potential framing points, punctuate the borders. Plan for framing when designing, look for framing when photographing. In this particular photo the shrubs are composed to be at the top of the frame but they are beautifully placed so that they provide structure and framing points for many photo angles. A classic technique for framing a garden photograph is to look for trees. They give vertical accents and edges while providing bulk and shape. Well-placed trees give the garden tremendous opportunity for strong design. Here in the garden of Andreas Hessing we see how redbud (Cercis occidentalis) and buckeye (Aesculus californica) trees anchor the ends of the two borders and frame the photo – and not coincidentally, the path to the house. 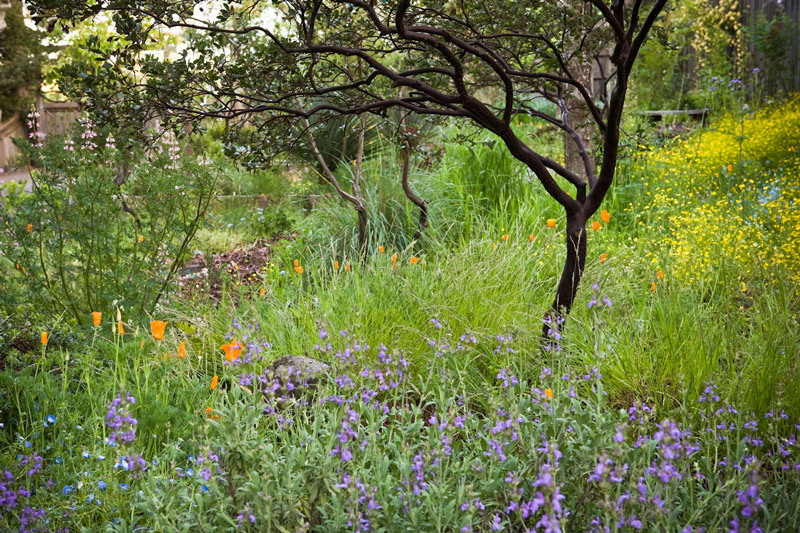 Most of us do not have the space in our gardens (or time in our lives) to see big trees become the strong framing tools we intend, but small trees like the redbud or buckeye above, or even large shrubs like fremontia (Fremontodendron californicum) or toyon (Heteromeles arbutifolia) or larger manzanita (Arctostaphylos) will become framing tools. 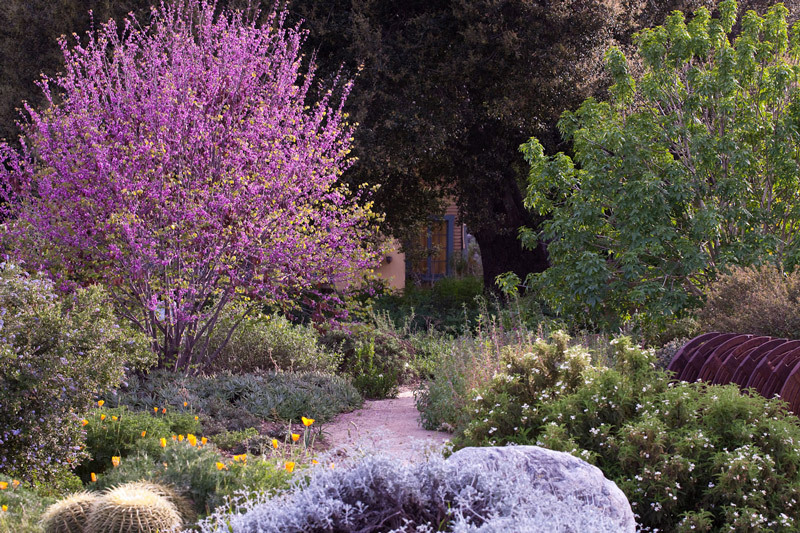 In Phil Van Soelen’s garden we see a mature Arctostaphylos used to frame this composition. The shrub was planted in the middle of a loose casual meadow and now that it is mature and well pruned it provides both structure for the loose design and framing for the photographer. To make an interesting photo look for these framing elements, and to design a photo worthy garden, plan for elements that the photographer can find, juxtapose and frame.